Does Your IT Support Make the Grade? Ever wonder why the technology in your organization is frustrating or even falling short? One common cause is using a one person technology solution. This may sound simplistic or even absurd, but a one person IT department whether on-staff or outsourced is destined for failure for a number of reasons. It really is not that much different than a family doctor. Nobody relies exclusively on one doctor without any assistant or team behind them. There are doctors, nurses, medical specialists, scheduling personnel, and even insurance and billing specialists. It requires a team to provide good medical care and sometimes additional people to help with health and wellness. Technology is very much the same. A lone support person almost always fall short in providing good, consistent, long-term service. The one person IT department most often is a fireman. This person runs from problem to problem, trying to solve them. The goods ones really care about solving the problem. The bad ones become jaded and don’t really care about helping, they just want to triage the problem and get back to their office. Most one man IT departments are very single dimensional. They are good at fixing things, or good at software programming, or good at hardware. However, it is rare that they are good at everything, and to try to fill the expertise gap, many try to leverage outside vendors and end up becoming merely a vendor coordinator. Others adopt solutions that are not tested, but are the ones that are quickly and easily available. It is hard to look at things strategically, if you are always up to your elbows in the day to day. The IT person who is putting out fires daily often does not see the big picture. Being strategic about technology is essential even in smaller organizations. Not being strategic can result in lost revenue, falling behind the competition, and costly inefficiency. 4. Who Covers Vacations & Emergencies? What happens if your IT person is suddenly unavailable for 2 weeks, or a month? Our organizations have grown very reliant on IT, and sometimes we have not considered just how crippling this might be. Technology is ever changing. It just does not stand still. Even the best single person IT departments lose their edge over time. Larger IT departments have a manager who sets goals on a training path for the department. Single person IT most often is focused on the daily list of problems and actions and does not have the time to determine an education path and pursue it. 6. Who Monitors Best Practices? This is one of the biggest shortcomings of one person IT. It is very difficult to follow best practices. Keeping up with best practices for things like security is nearly impossible and, there is nobody to provide oversight. The list of crazy things I have seen over the years that fall in this category are outrageous. One that comes to mind is the fairly large company I encountered a few years ago who had no backup plan. When interviewing the one man on-staff IT department, he said that he ran a manual backup to USB drive when he had time. This would be scary for a small company of a few users, but this was a manufacturing company with 75 users and countless man hours per day invested in data. Occasionally, there is a multi-dimensional IT person who manages to keep up on his own and do well. If you found one, two issues often arise. First, they get bored. This results in them moving on to another company after they are trained and working well for you. Second, sometimes they begin to experiment on your time. A few years ago, I encountered an organization with a one man IT person who had created a very secure network. The problem was that he did not have enough to do, so he spent his spare time learning Cisco security by locking down the network to the point of making it unusable. A one person IT department often is limited in their vision to your company, or the handful of companies they work with. They do not have exposure to other ways of doing things, or a broad base of IT concepts. They often become secure in their limited knowledge. It is not uncommon to find a company that is doing things in a very convoluted or outdated way, just because that is the only way their IT person knew to do them. I am not sure what creates this mentality, but I have seen it repeatedly from one person IT departments. One IT person I met with spoke of the other people in the company as “my little children”. Another recently said to me “they will complain no matter whether a give them an old machine or a new one”. Understanding the role of service to the company is key, and it is easier for an IT person to become jaded when he is on an island with no team to back him up. This sometimes happens unintentionally and sometimes purposefully. Job security, some say. Regardless, of how it happens, it is easy to be held hostage by your one person IT support, who may be the only one with key security information and knowledge about your technology. A successful IT department does not happen by chance. It is the result of careful planning and process. Paying attention to strategic and long-range planning, as well as the day to day resolution of issues is necessary. A disciplined IT department will help you get to the next level, and protect your organization from risk. 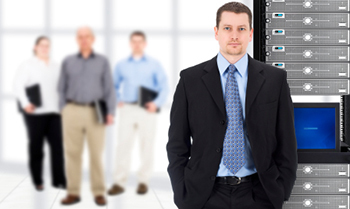 Please don’t hesitate to contact me to discuss our disciplined outsourced IT offering that addresses these needs.